If you’re Vietnamese and you don’t like Pho, there’s definitely something wrong with your genetic make up. Pronounced ‘FUH’, pho is Vietnam’s national dish and the thought of that single syllable makes my stomach grumble with longing. Pho’s concept is simple: make a fully-balanced meal fit into a single bowl. 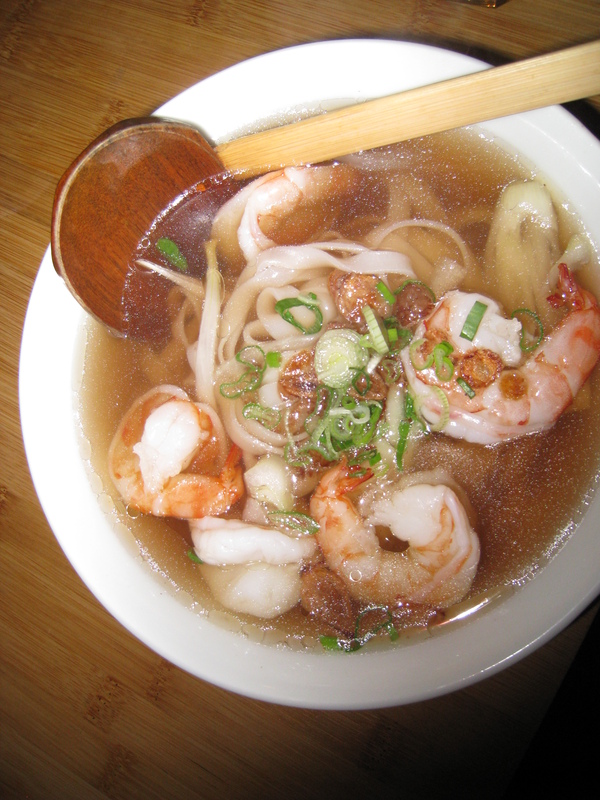 The main components are rice noodles, broth and some sort of protein – beef or chicken or seafood, sometimes tripe or meatballs or a combination of different meats and broth. The protein goes into the bowl raw and cooks when the boiling hot broth that has been simmering for some hours is poured over it. The broth varies in strength and flavour depending on the region of Vietnam, often containing spices and herbs like cinnamon and ginger, coriander seed and clove. 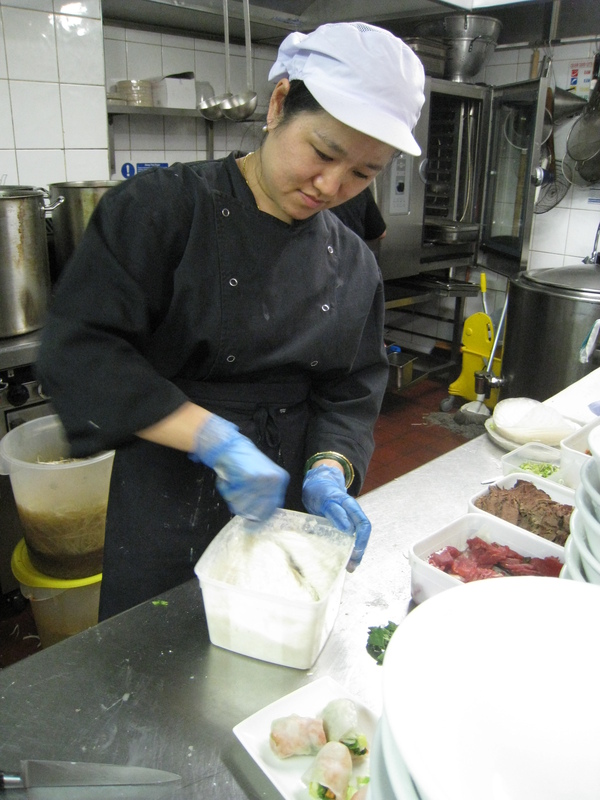 Once served, the consumer can then season it to their own personal taste with condiments like chilli, spring onions and fresh herbs. When Monsieur and I were preparing for our trip to Vietnam, pho seemed to pop up everywhere. 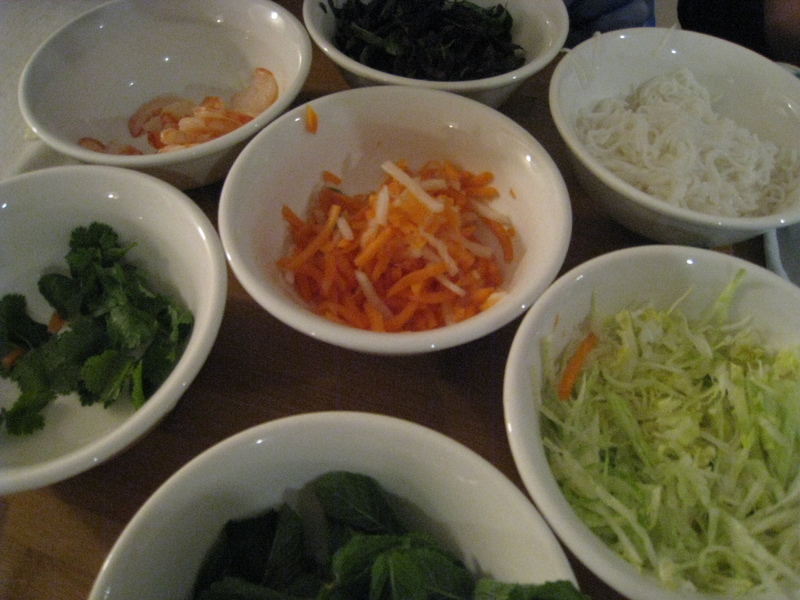 It was mentioned in all the guides, in online reviews, in restaurant recommendations, and if you look up ‘pho’ on You Tube, you’ll find the likes of Anthony Bourdain trying it out in Ho Chi Minh City and amateur pho chefs demonstrating step-by-step instructions on how to make pho at home. Once in Vietnam, Monsieur and I and enjoyed authentic pho on several occasions, marvelling at the regional subtleties and the many ways in which the simple concept of a meal in a bowl may be interpreted. The Vietnamese say that Pho is their equivalent of chicken noodle soup. It’s an anti-viral cold-preventative, hangover cure and all-round comfort food. For all of these reasons and because Pho simply tastes good, Epic is a great, big pho fan. Back in March of this year I was lucky enough to be invited to a food bloggers’ event at a restaurant specialising in pho, called, not surprisingly, Pho. 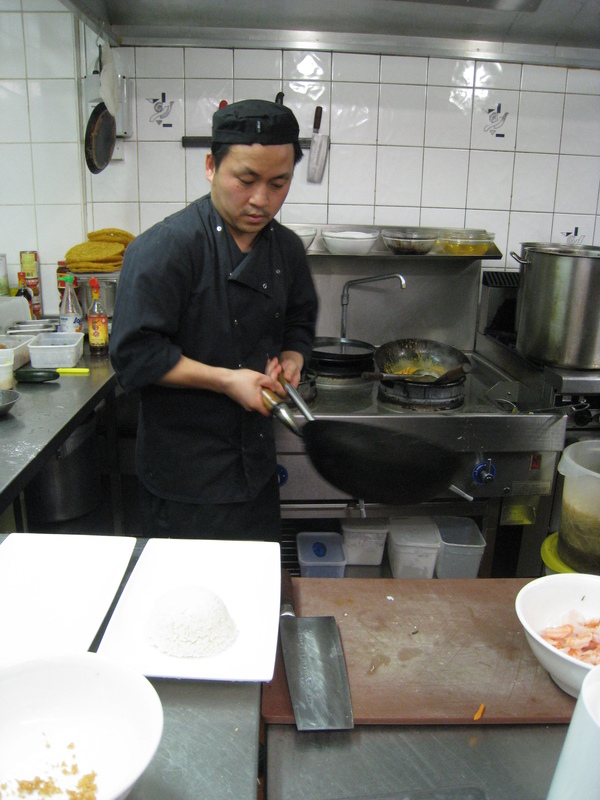 There are now four restaurants in the Pho chain; we went to the one in Great Titchfield Street. 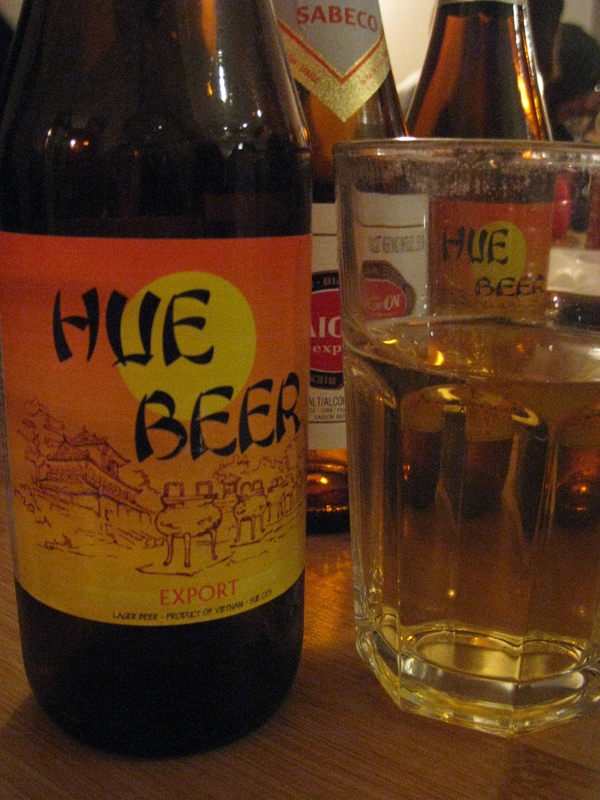 There, in a bright basement, we were treated to welcome drinks, including wine or Hue beer, a popular Vietnamese brew. It was Hue all the way for me after that. 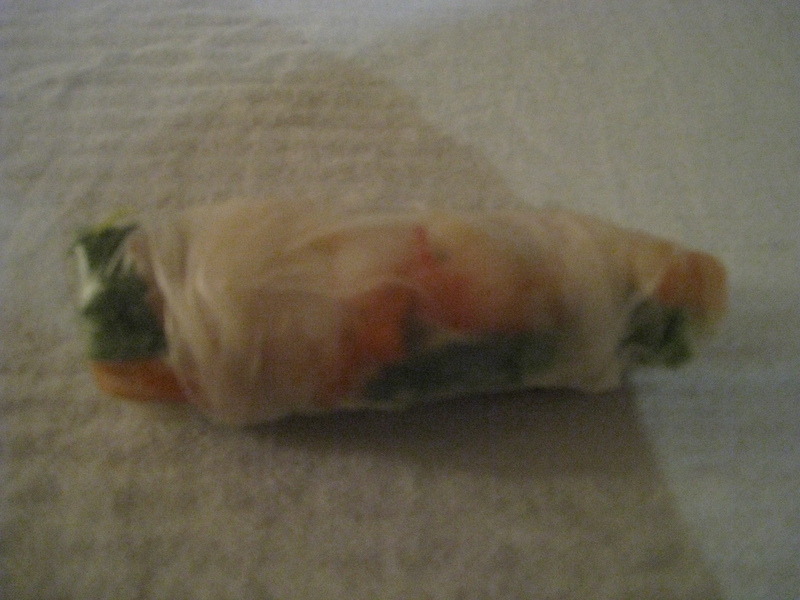 First up, we enjoyed learning to make our own summer rolls. I wasn’t exactly adept at this (mine resembled more of a lopsided sausage factory reject than a neat little roll), but I did enjoy eating the results. 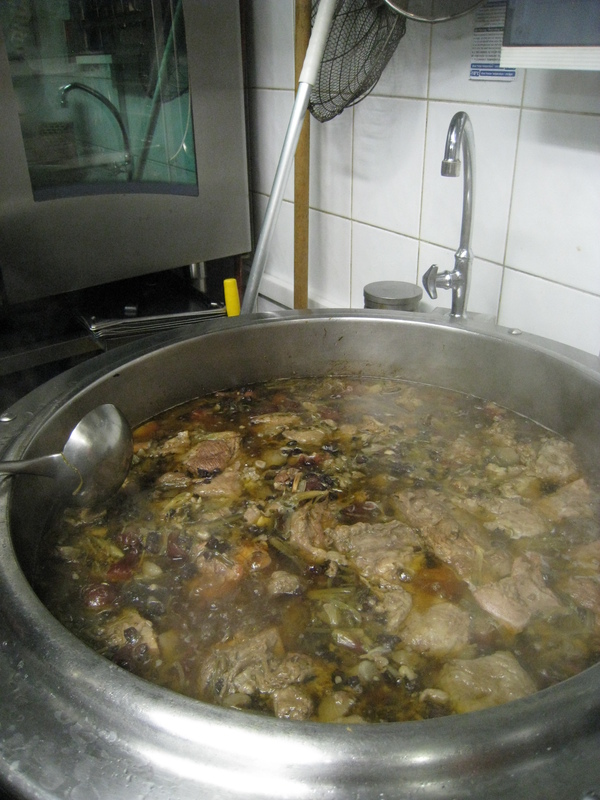 And this is what the staff work so hard to produce – vat upon steaming vat of bubbling hot broth. Back at our very long table, the crowd was like a Who’s Who of London food bloggers, which made for passionate conversation about who’s cooking/eating what, where to shop for the best ingredients and which chefs we rate or otherwise. There were collective aaahs of approval as we nibbled on our summer rolls and dipped into the share platters of Vietnamese salads. Outside it was dark, cold and rainy. 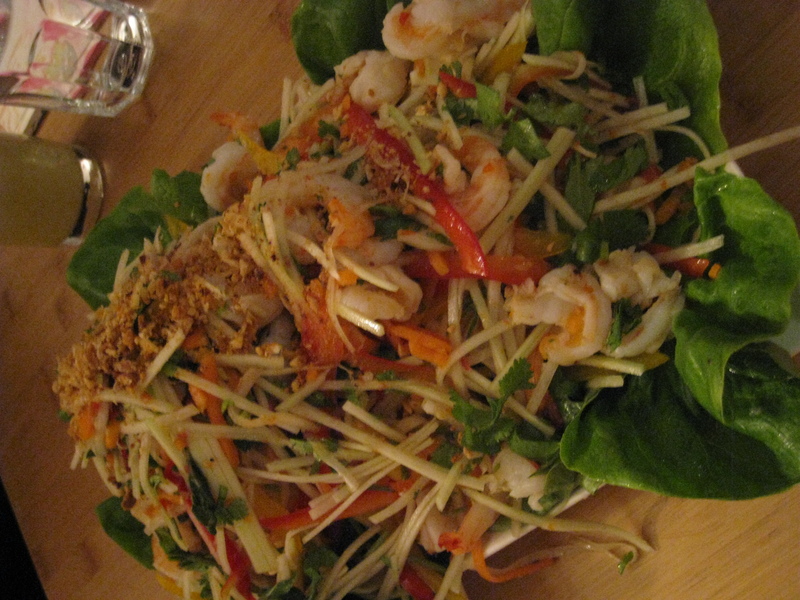 Inside at Pho we could taste summer in the fresh papaya salad, delving for the fat prawns in its midst. This platter, called Goi Du Du in Vietnamese, is sprinkled with chopped peanuts and served with prawn crackers. Everything (apart from the prawns) crunched in a satisfying way: the batons of papaya, the strips of capsicum, the peanuts, the crackers. It was a welcome antidote to the misery of March weather. At last, the moment came when we could taste the pho of our choice. On the menu was quite a list of pho varieties – served with steak or brisket, or both, with meatballs, chicken or prawns or a couple of vegetarian versions with tofu or mushrooms. I had Pho Tom – more fat tiger prawns served in chicken stock. 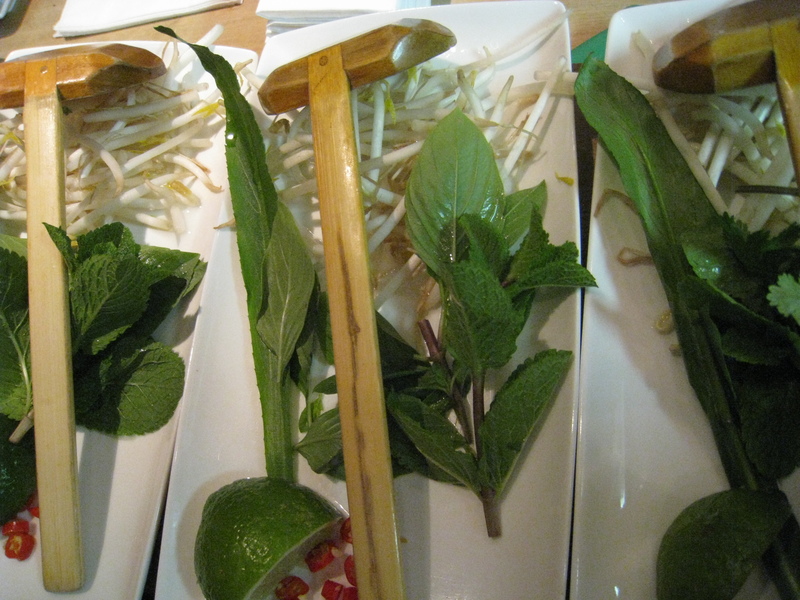 The bowls come with special ladle-like spoons and a selection of condiments with which to bespoke your pho: Vietnamese coriander (which looks like mint but tastes completely different), beansprouts, chilli and lime. Here’s my bowl of glory, steaming away merrily. 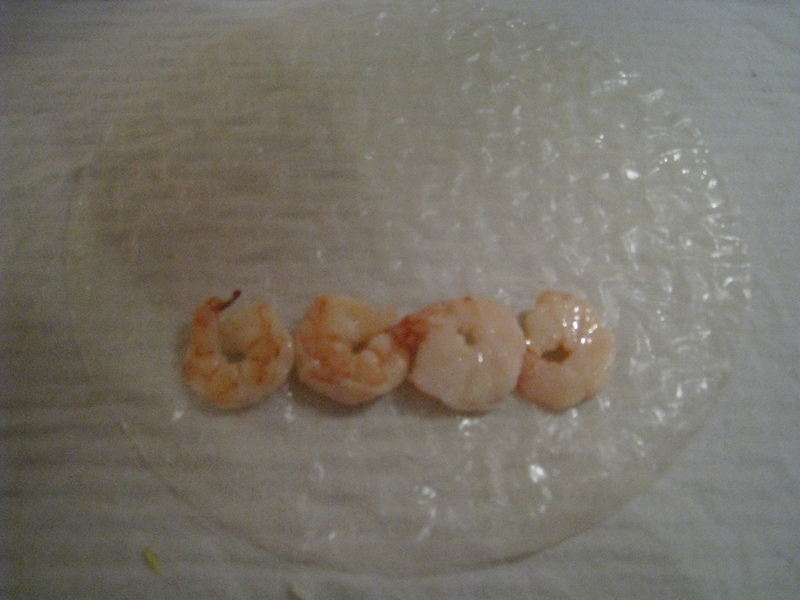 The broth was piping hot, the prawns tender and plump with juice. Lots of happy slurping went on around the table that night and the general consensus was that Pho was modern, affordable, with the freshest of ingredients and therefore definitely had its place in London. Following the spring rolls, salad, a bowl of Pho and a couple of Hues, I was overflowing with good things and had zero capacity for dessert, which was a shame because the Pho menu boasts banana fritters, pandan pancakes and fresh fruit sorbets with flavours like strawberry with fresh basil. I did, however, cave in to the offer of an iced Vietnamese coffee made with condensed milk. I know, I know, it sounds odd, but it’s like a Vietnamese frappuccino and they’re really quite addictive. So with a round and happy belly I bade farewell to the warm Pho staff and foodie friends, toddling off in the rain in search of an elusive cab, smile on face, with a stomachful of Pho. Methinks that Pho isn’t just the Vietnamese cure-all comfort food, but Vietnamese prozac in a bowl, for it shifts my mood to happy every time. What!!! there is something called a “summer roll” now? 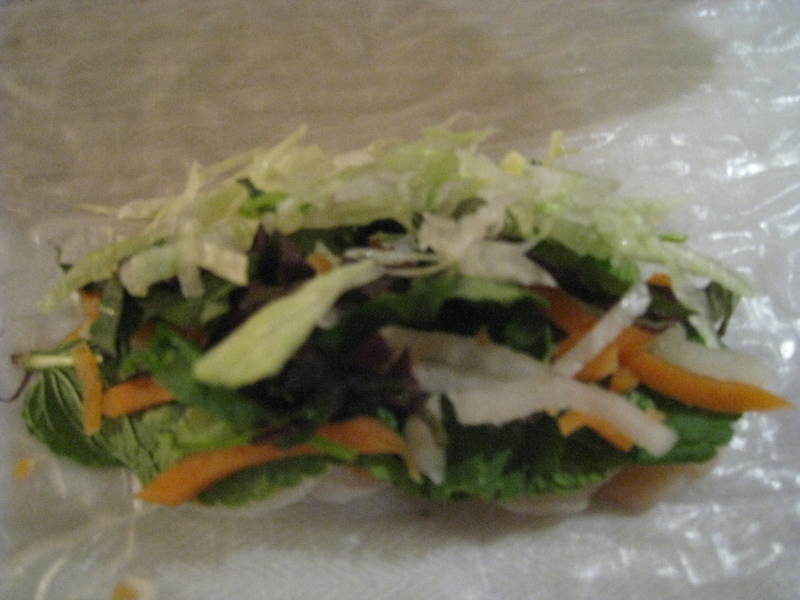 It will never catch on … not after my “winter roll” hits big. hee hee! note: the wooden spoon in the last photo reminds me that some things are not condusive to eating properly … but still exist for some reason … in some countries … for some reason. Planet, my pal, you’ve got me there. They weren’t spring (deep fried) and this took place in winter, so maybe calling them SUMMER rolls was a ruse to cheer us up? Go figure. As for those big spoons? Slurpfest central. But living in Japan you would know that there was also a lot of chopstick action going on. Blue Monkey says kon banwa by the way. Mel – I know what you mean. I started to crave some Pho so went back a couple of weeks ago. Just as delicious as I remembered it. That prompted me to look out my notes on our visit to Pho back in March. I felt bad because I didn’t have time to write it up before the Epic Nuptials. Better late than never. 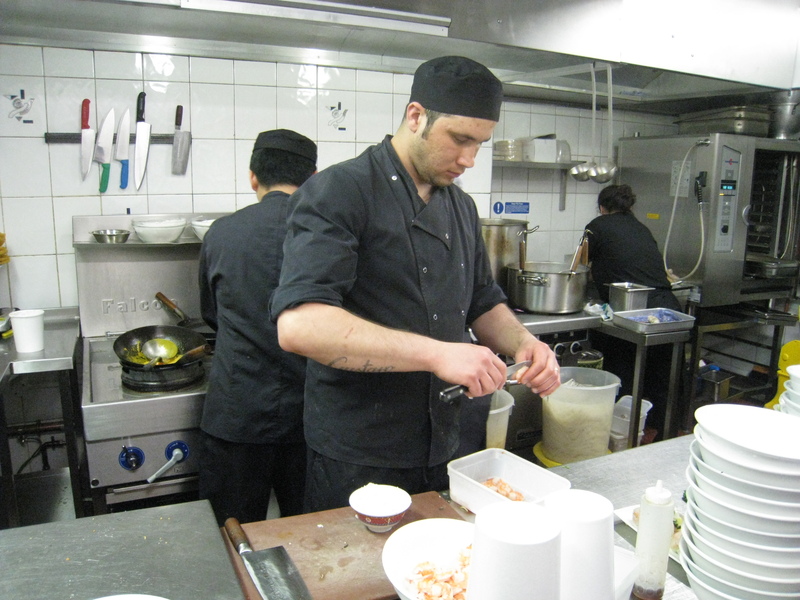 Have you been to the branch in Wardour Street yet?